Need a little support for your new router table top? INCRA's new Router Table Stands provide a rock solid base to build on. These are the most innovative stands ever offered for sale! Everyone eventually wants a router table cabinet with doors, drawers, and downdraft-style dust collection, and these router table stands give you a big head start by serving as the supporting framework. 14-gauge, powder coated steel stringers near the bottom offer stability and a means of easily installing a shelf board. At the top, there are matching, full-circumference steel aprons to best maintain the flatness of the router top. In addition, extra sets of stringers can be ordered to add shelf supports at varying heights. Overall dimensions at table mounting flanges: 28-1/4" W x 20-1/8" D x 34-5/8" H (min). 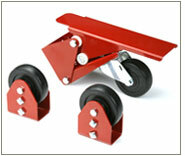 Non-skid leveling feet offer 1.5" of height adjustment. To see how easily INCRA Router Table Stands can be turned into organized storage, check out these cabinet plans and two-part build video from Guy's Woodshop! Plans are for the larger RTSTAND43, but the same principles apply to this compact RTSTAND36. included. 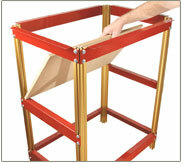 Great for installing user-supplied shelves within the stand. Use this INCRA Wheel Kit to make your router table mobile in a small shop. Compatible with our Router Table Stand 36 and Router Table Stand 43, the kit features powder coated 14 gauge steel parts.